The Flute sonata in G major (HWV 363b) was composed (circa 1711-16) by George Frideric Handel for flute and keyboard (harpsichord). The work is also referred to as Opus 1 No. 5, and was first published in 1732 by Walsh. Other catalogues of Handel's music have referred to the work as HG xxvii,19; and HHA iv/3,28. The sonata was originally composed as an oboe sonata in F major (HWV 363a). 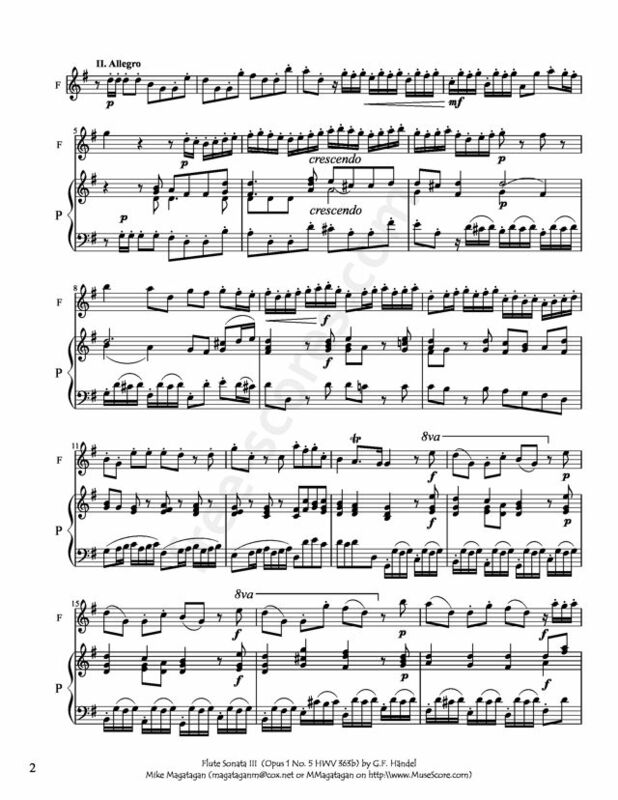 Both the Walsh edition and the Chrysander edition indicate that the work is for recorder ("Flauto"), and published it as Sonata V.
The sonata begins with an Adagio that is derived from an aria in Handel's opera Rinaldo. Over a stately harpsichord accompaniment, the flute delivers a long-lined melody punctuated by brief sighing phrases. This leads with an unresolved cadence to the Allegro, which launches itself with the aforementioned stuttering trumpet call. 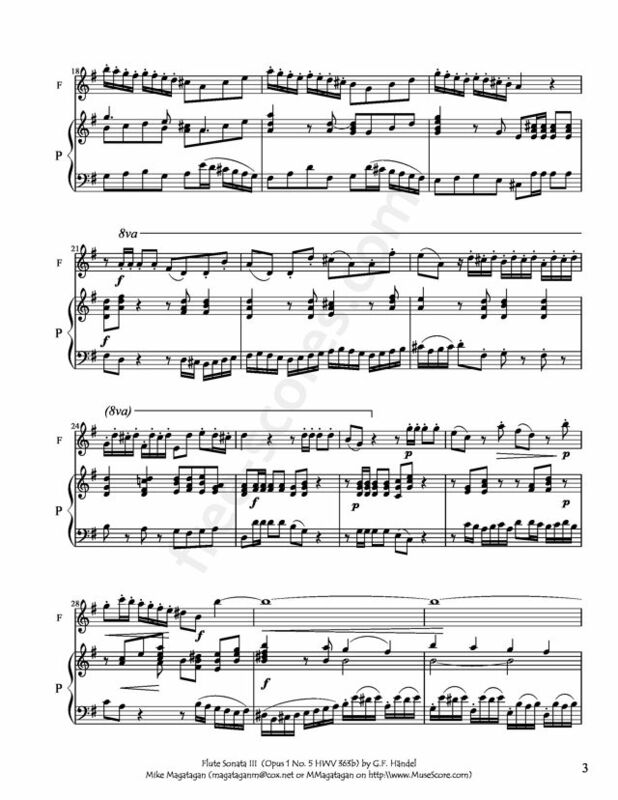 The motif reappears frequently, and provides the basis of much of the harpsichord accompaniment, while the flute spins out highly florid melodic lines. A second Adagio begins with a falling, stepwise figure in the continuo, whereupon the flute develops a broader, pensive melody that allows for generous ornamentation. The concluding Minuet (Handel uses the Italian spelling, Menuetto) is a lively, truly dancing piece that wouldn't be out of place in Water Music. Its duration is less a matter of tempo than how many repeats the performers choose to observe. By Lorna McGhee. By Dr. Shinichi Suzuki. This edition: International. Method/Instruction; Suzuki; Woodwind - Flute (Suzuki). 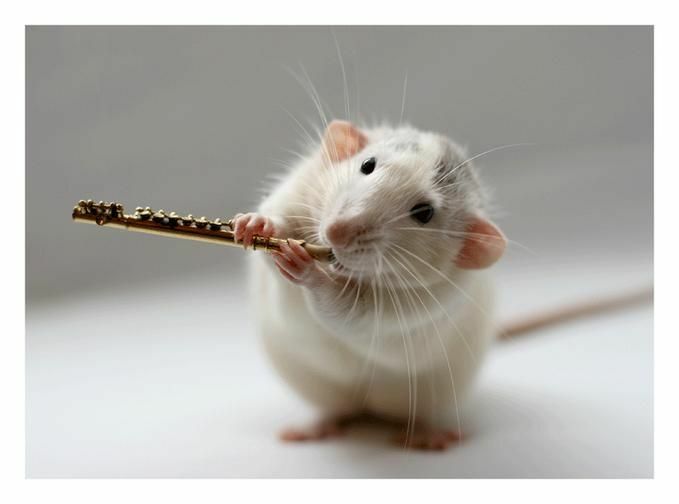 Suzuki Flute School. CD. Alfred Music #00-42240. Published by Alfred Music (AP.42240). 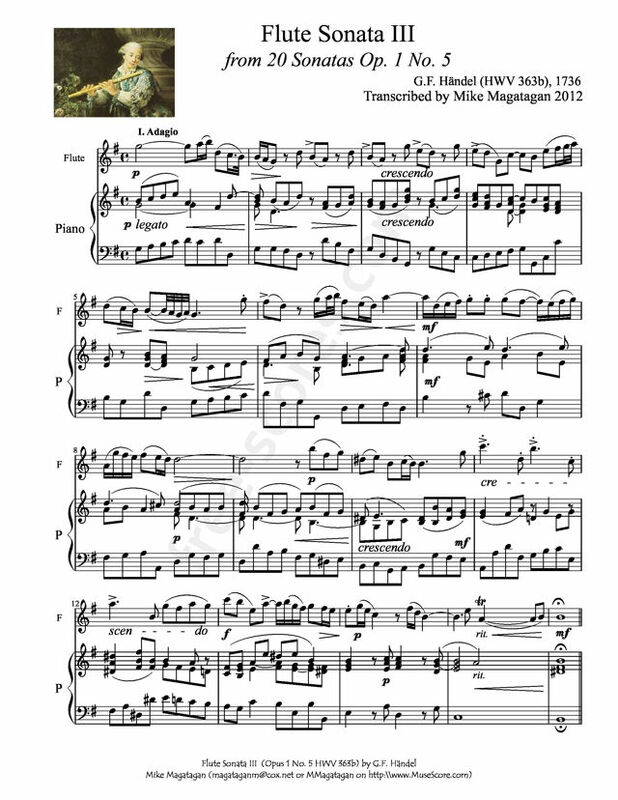 2 partitions trouvées pour "Sonata III for Flute & Piano"